Latest Rajasthan PSC Rajasthan school lecturer syllabus 2018 we are provided in this article. 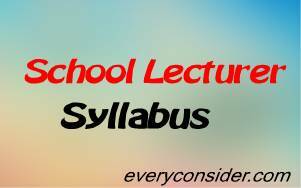 Check RPSC school lecturer syllabus with the first grade teacher exam type and exam pattern. We are provide to direct link to visit www.rpsc.rajasthan.gov.in to know more detail about his requirement and syllabus pattern we are also provide be given syllabus exam pattern. This exam will be divided in two papers. We are provided about these two paper details blow and also provide old paper exam for school lecturer recruitment 2018. The competitive examinations cell carry 450 marks. There will be two papers- paper first salary of 150 marks and paper II Shell be of 300 marks. Duration of paper 1st shell be one and a half paper and the duration of paper 2nd shall be three horse. All the questions in the both the papers shell be multi choice type questions. Negative marking shall be applicable in the evolution of answer. For every wrong answer one third of the marks prescribed for that particular question shall be deducted. Explanations wrong answers Salman and incorrect answer or multiple answers. Subjects included in both the paper and the marks given to them also in the paragraph believe. Paper -1st (first) general orange and general studies duration 1 hours 30 minutes. If have a any Questions, YOu can ask freely in comment box or send e-mail. We are trying to give Reply soon.